I got up early – well I think it was around 7:00, not too early – and drove north to Yosemite stopping on the way for some breakfast. I was entering Yosemite on Labor Day so I figured it would be too crowded to do much of anything. My plan was just to drive through and to see as much as I could before heading to Lake Tahoe. 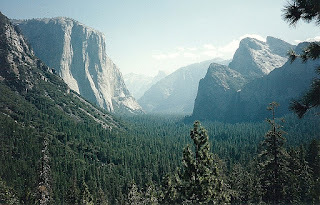 I entered through the south entrance and took the road to Glacier Point. From this vantage point you can see the entire Yosemite Valley. I took some pictures of the incredible views of El Capitan and Half Dome. Several spectacular waterfalls could also be seen from up there. I got back in my car and made my way down into the valley. As expected it was bumper to bumper all the way around the valley loop. I did try to find a parking spot in one area without any luck so I said to heck with it and left the valley as fast as I could … in other words at a snails pace. Once I got out of the valley, traffic thinned. I was going to drive Tioga Road and leave the park on the east side. The drive through the park is remarkable. I stopped a few times to stretch my legs and take pictures. It turns out I would do the exact same route through the park with the wife 10 years later. I reached the park exit and headed north to Lake Tahoe. I had made reservations in a hotel figuring that it would be packed. When I arrived I was surprised to find the place relatively empty. My hotel was too far from the casinos. I walked to the Nevada side and looked around the casinos. Most of the shows were dark which probably explained the lack of people. I found a hotel closer to the action and made a reservation for the next night. The next morning I checked out of one hotel, checked in the other hotel, and went for a drive around the lake. I didn’t really plan this part of my trip well. There are a lot of hiking trails that I probably would have enjoyed but I didn’t even look for any while I was there. I stopped at Emerald Bay and took a picture of Fanette Island, the only island in the lake. From there I walked the mile down to Vikingsholm Castle but I didn’t tour it – I think it was closed at the time. The owner of Vikingsholm also had a tea house on Fannette Island. After scooping the loop around the lake and seeing all the houses that I’ll never be able to afford to buy, I went to the casinos and threw money away … I mean I gambled. I’m not much of a gambler – I’m not good at it and I don’t have the self control to stop when I’m ahead. I think I blew $60.00 which isn’t that bad. That evening I went to a couple of mediocre shows (Escapades and High Voltage) at Harrah's. Lake Tahoe was nice and pretty and all, but I really should have hiked. Since I didn't, it was a little dull. Because of that I decided to leave a day earlier than my original plan and head to my next destination, Crater Lake. Pictures are here.